Israel has been calling to me for a long time. It probably started about six years ago, when I was gifted Yotam Ottolenghi’s cookbook, Jerusalem. The food in the cookbook looked insanely delicious, but even more capturing were the photos taken of city dwellers, chefs, and shop owners in the Holy City. Each photo felt so alive, spattered with vivid colors and every day people, existing in a world that felt so raw and different from the one I lived in. So thanks to Ottolenghi, Jerusalem made it’s way to the top of my travel bucket list and sat there for a few years. Then, last May, Kai and I finally decided to take advantage of a long holiday weekend a book a trip to Israel! 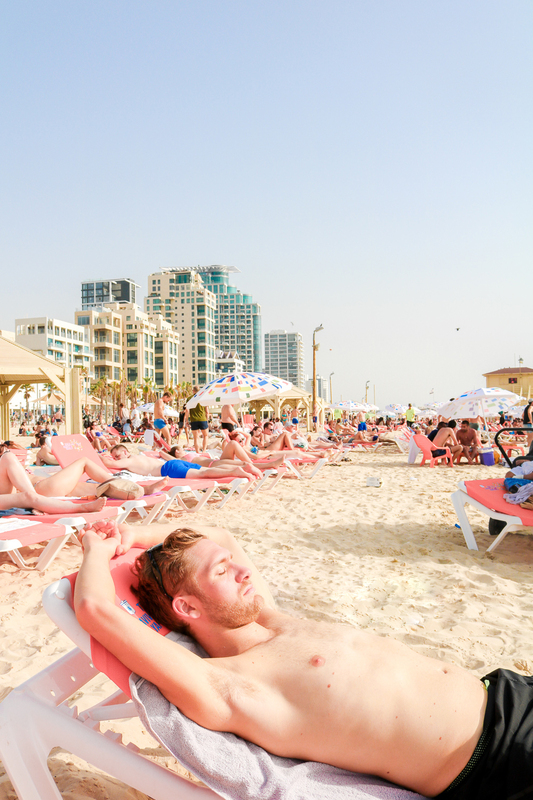 Prior to booking any hotels, we spoke to a few friends who had recently been to Israel, and they advised us to spend the majority of our time in Tel Aviv, which is much more progressive than Jerusalem and also a beach city. They suggested spending one night in Jerusalem, which would be just enough time to take in the holy sites. So this is what we ultimately booked, and we were very happy with the decision! Then, a week before our trip, the US moved their Israeli embassy from Tel Aviv to Jerusalem, which lead to incredibly high tensions in Israel. In moving the embassy, the US acknowledged Jerusalem as the capital of Israel, a city that is still to this day claimed by both Israel and The State of Palestine. And so the fighting between Palestine and Israel on the Gaza Strip and the West Bank intensified, and Americans were warned to steer clear of the country. We debated canceling our trip, but in the end decided that our chances of being targeted or caught up in some kind of chaos were quite low, although we did do some extra research on Jerusalem to acquaint ourselves with the neighborhoods to avoid and what to wear so we would not draw attention to ourselves. 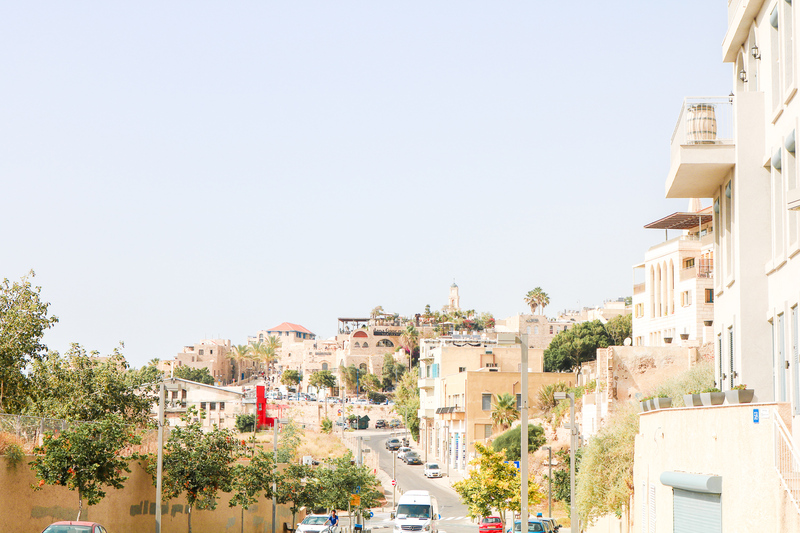 We also learned a few local phrases so we could pop in and out of shops discretely, and we decided to skip visiting the Dead Sea, as travel through and around the West Bank was strongly discouraged. We had Monday and Tuesday off of work, so few into Tel Aviv on Saturday morning, planning to be in Israel for four days. Saturday is the sabbath in Israel – a holy day of rest – which means that the Jews don’t work. So the vast majority of restaurants, stores, and even public transport facilities were closed when we arrived. Israel’s national airline doesn’t even fly on Saturday! 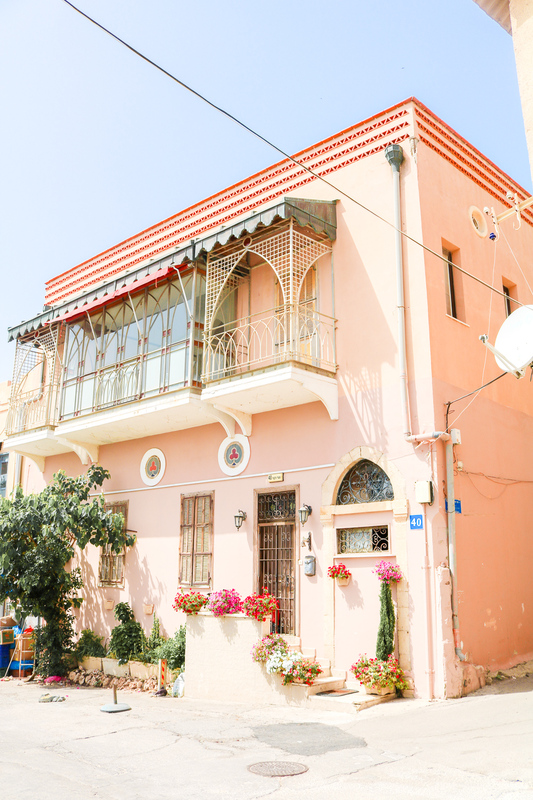 Thankfully, we found an a beautiful apartment in Tel Aviv on Airbnb, with a host willing to welcome us on a Saturday. 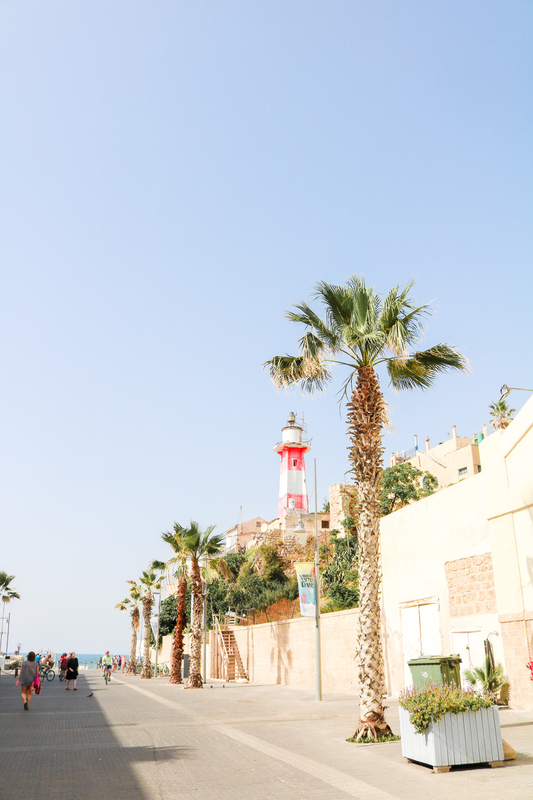 We chose to stay in Jaffa, steps away from Old Jaffa (the city’s gorgeous old town), some awesome flea markets, and breezy harbor side restaurants. 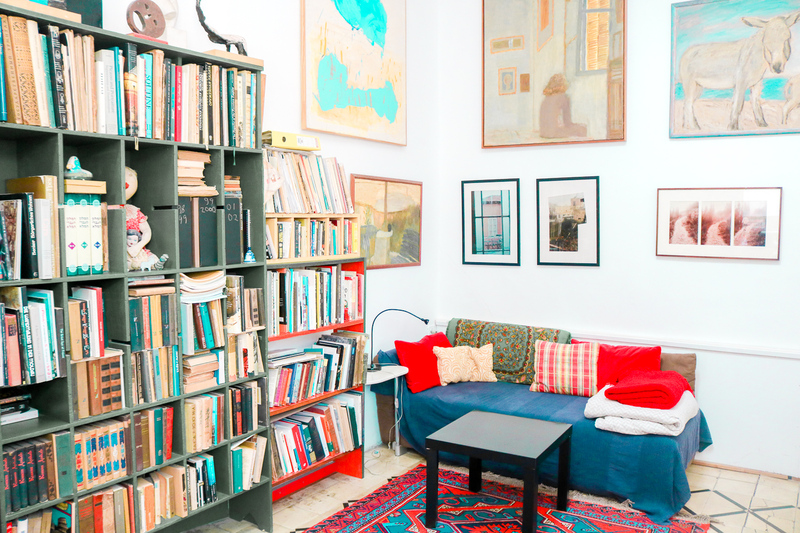 The loft we stayed in had an artist’s touch, with huge canvas paintings hanging on the walls, antique furniture peppered throughout the space, walls filled with tall stacks of books, and an adorable balcony. Our wonderful host gave us a bunch of local recommendations, including a few tips on where we could find food on the Sabbath! 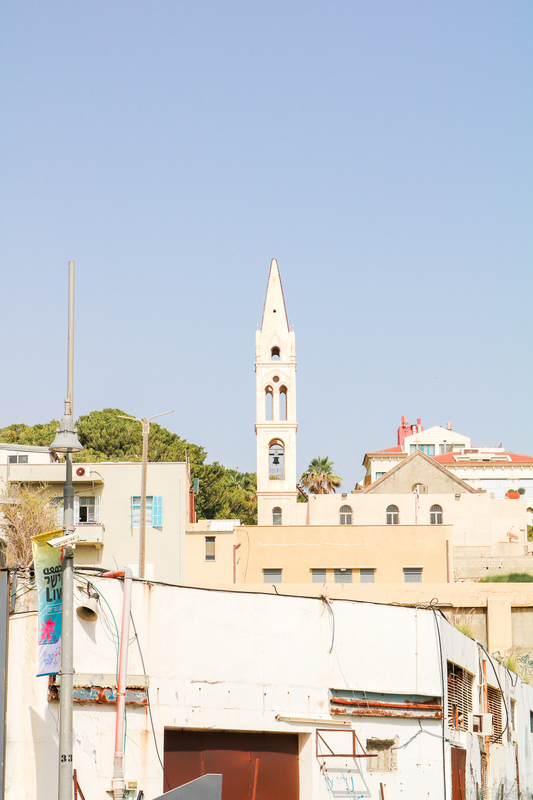 So we threw on our bathing suits, grabbed our things, and hit the streets to explore Tel Aviv! How dreamy is this garden?! Our first stop was Bistro 60 – a spot we came back to two other times while in Tel Aviv – the restaurant was THAT good! 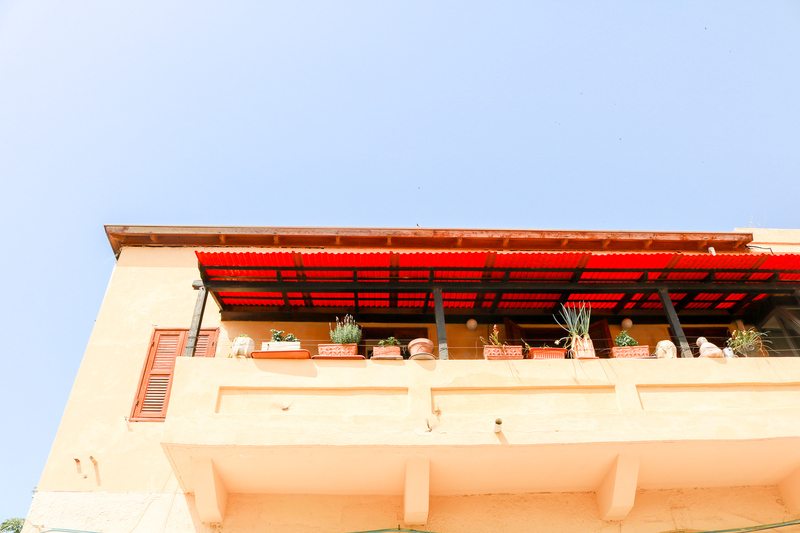 We sat outside ordered a salad with hallumi, deep-fried cauliflower, and a grilled eggplant and tomato salad to share. Each dish was drenched in tahini cream and sprinkled with a hearty dose of fresh herbs. The meal was divine. Turns out, all of my favorite foods – humus, eggplant, hallumi, tahini, falafel – are Israeli specialities! I could eat like this every day for all the rest of my days! We finished every last drop of food! After our feast, we made our way to the seafront where we rented bikes and cycled along the water. The city was blooming – with colorful florals exploding every which way. 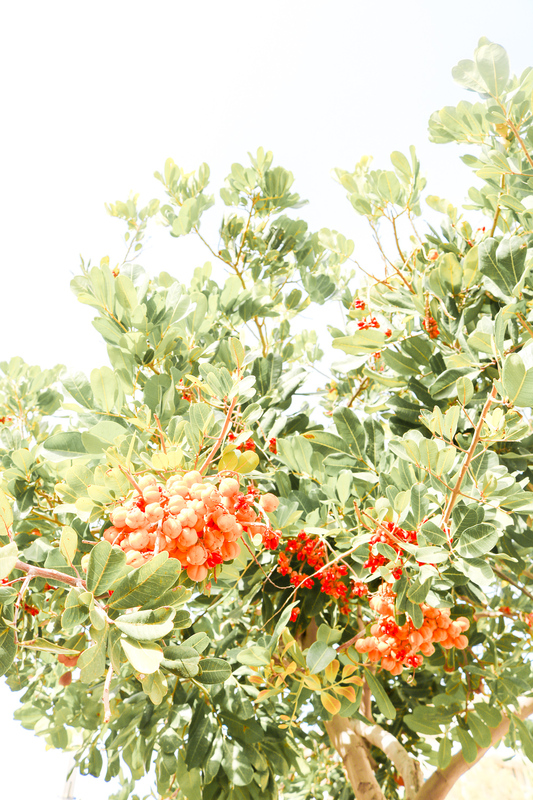 Look at all of this fruit, just blooming on the side of the road! We decided to stop when we reached a large sandy stretch with lots of beach chairs for rent. The beach clubs were closing soon (it was close to 4pm) but the sun was still high in the sky. We lucked out and got lounge chairs for free, as the attendants would be going home in the next hour and were spending their time collecting chairs rather than handing them out! So we bathed in the sun for an hour, Kai sleeping and me poking through books on my Kindle :) After Kai got in his sunshine nap, we returned our chairs and headed to La La Land, a nearby beach club, for an adult beverage. La La Land was our favorite beach bar in Tel Aviv – there was a great selection of cocktails on the menu, the staff were friendly, and the beach party ambiance was in full swing as the sun began to set. After a drink at La La Land, we beach club hopped our way further down the coast, stopping for a drink at two more spots before the sky finally went dark! At this point, we’d somehow managed to walk about five miles down the coast, so we rented two new city bikes and made our way back to the apartment to change for dinner. Although we’d had a huge, late lunch, we wanted to enjoy a Saturday night out on the town! So we walked to the lively center of Jaffa, where we found a band playing music in the square, streets overflowing with people, and an awesome selection of restaurants! We put our name in for a table at Puaa, a colorful bohemian restaurant, and ordered a cocktail from the hostess which we were allowed to drink on the street while waiting for our table (I love you Tel Aviv!) Kai and I like to order a few dishes to share, and this time around we went for a smoked fish and cream cheese starter, a coconut chicken curry, and a lamb and pine nut stir fry. To kick things off, the wait staff surprised us with shots to share, and I’m pretty sure between the two of us we ate three baskets of fresh bread! (It was a LONG day of cycling and walking!) 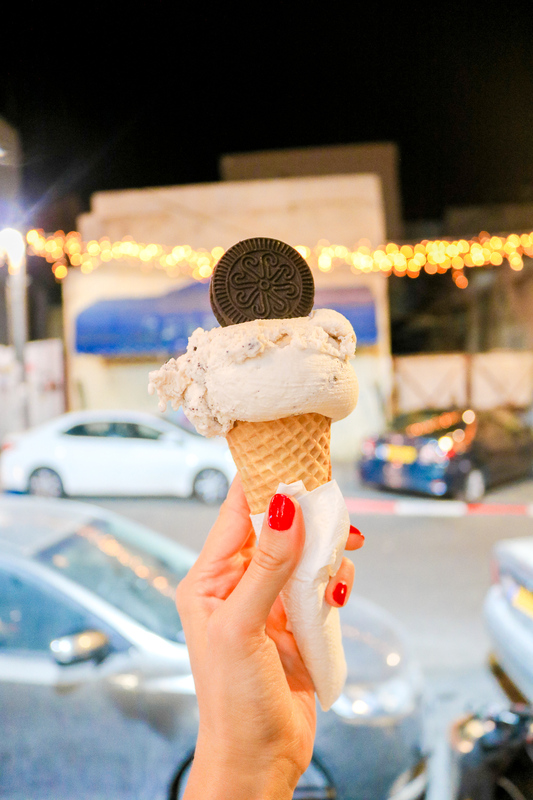 After dinner, we slowly made our way back to the apartment, stopping for an Oreo ice cream along the way . . . and to pat the many cats who said hello along our route! 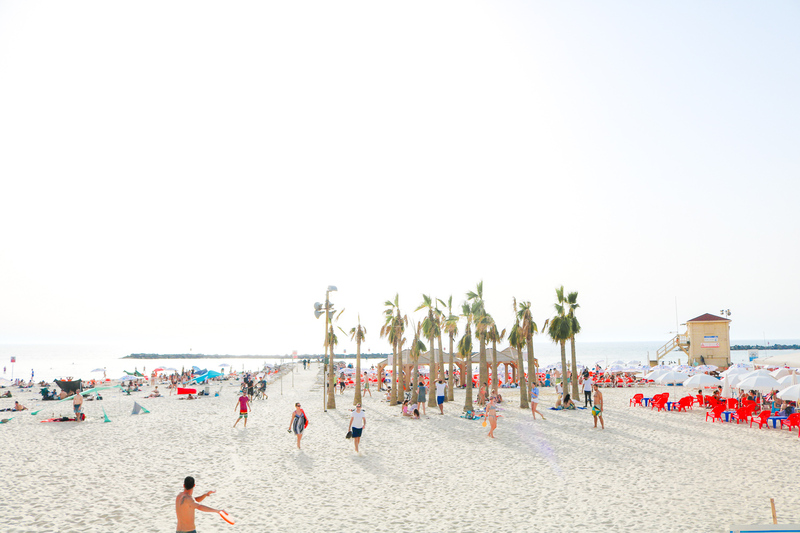 It was the BEST first day in Israel, filled with food, sunshine, strolling, and down time. 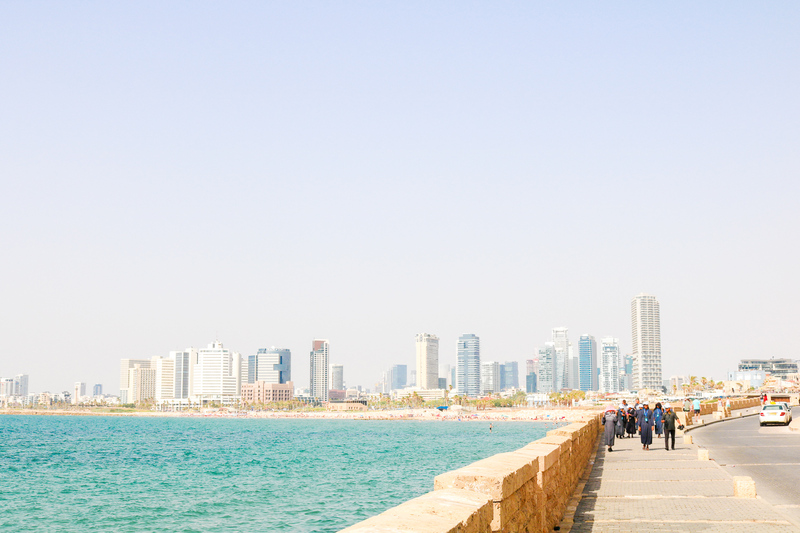 After only one day, Tel Aviv had cemented it’s place in my heart – the city was so unexpectedly AWESOME!! And the food was some of the best I’ve ever had. I can’t wait to share more of our adventures in Israel with you!